The championship game tipped of at 1:30 p.m. at the Alamodome in San Antonio. 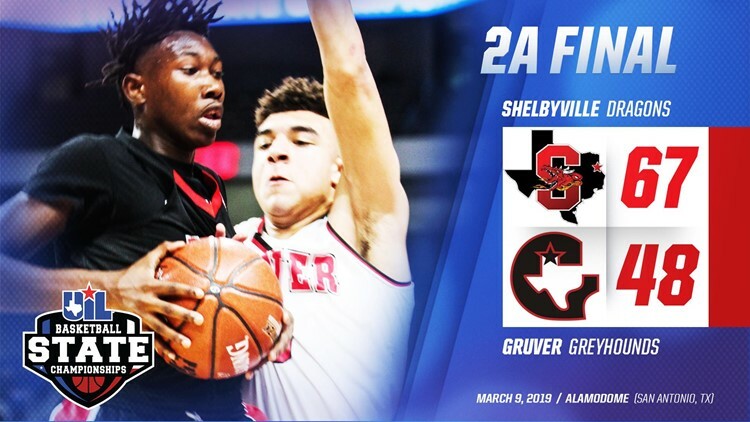 SAN ANTONIO — The Shelbyville Dragons defeated the Gruver Greyhounds 67-48 to claim the UIL 2A boys basketball state title. Shelbyville defeated the Hearne Eagles 83-51 Friday morning to advance to the Saturday's contest, while Gruver took down Martin's Mill 55-42. Shelbyville junior guard Jay Buckley was named MVP with 28 points, eight boards and four steals. The Dragons shot 49 percent (25-51) from the field. They also knocked down seven three-pointers (7-11). Shelbyville pulled down 36 rebounds, recorded eight steals and six assists. They also shot 50 percent from the charity stripe (10-20). The 2A state champs finished the season with a record of 39-3 with their only losses coming to Spring Hill (4A), Lipan (1A) and Winnie East Chambers (3A). Congratulations to the Shelbyville Dragons! You've made East Texas proud!